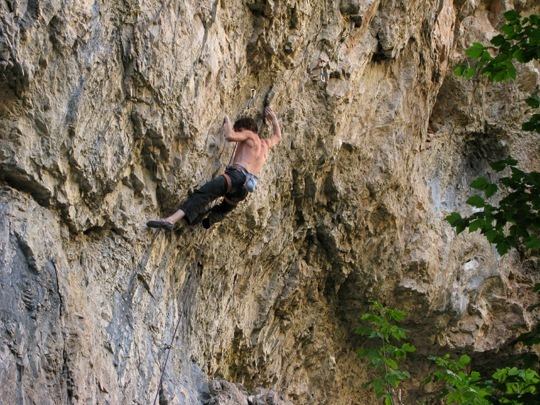 If you are looking for some evidence that people can get along in this crazy world of partisan presidential politics and large financial institution collapse, look no further than the limestone walls of Rifle, CO. Rifle is home to frequent controversies over things like ego, ethics and who can climb a route using fewer kneebars on it’s featured choss limestone. However, recent events have proven that top end climbers can get along. The recent controversy involved a tiny red tag on a closed project. The project, which was bolted by Andy Raether, added a hard direct start to an existing 5.14 (also bolted by Raether) at Rifle’s Bauhaus crag. Having climbed most every other hard route in Rifle by last fall, Dave Graham and Joe Kinder were itching to get on something harder. Kinder posted on his blog about how he felt the continued closure of this Bauhaus project was “degressive” for the sport of climbing. Nevertheless, they respected the closure. Graham and Kinder were back in Rifle with the situation unchanged. They had still climbed most every hard route worth doing in Rifle, and the project was still closed. Apparently fed up and determined to climb the route with or without Andy’s permission, they started trying it while continuing to talk things over with him. After some continued negotiations, the red tag was finally lifted. According to Kinder, Andy “gernously opened the route after some intense phone conversations”. With the situation resolved, Girl Talk (5.14c) was realized shortly thereafter by Graham. In the 2+ weeks since Graham’s FA, Girl Talk has been repeated by a who’s who of elite American sport climbers (which has no doubt validated the opinions of Graham and Kinder). So far it has been repeated by Kinder, Daniel Woods and Ethan Pringle with Pringle’s repeat coming within a single day’s effort. I guess that’s pretty progressive, no? 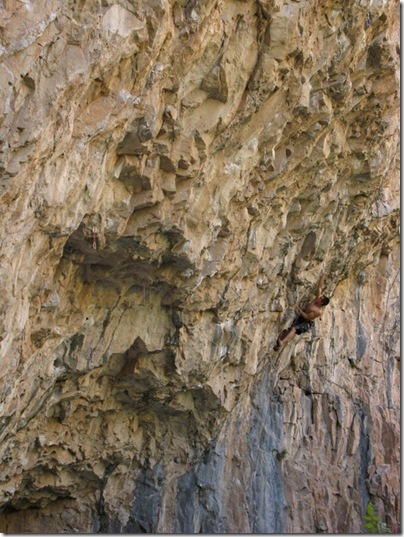 With Chris Sharma on his way to Rifle, it is safe to assume that Girl Talk could be seeing a 5th ascent in short order. * If you haven’t heard, he is in pretty good shape. Could a repeat of Tommy Caldwell’s unrepeated Flex Luthor (5.15a?) be on the horizon? Too bad that it is “kind of a turd” according to Kinder. Update: Somewhat coincidentally, MVM has just posted video of Dave Graham on the FA of Girl Talk where he explains a bit about how they came to trying the route. It sounds like Andy bolted an incredible route. * – (Chris went to Maple Canyon instead it would appear). – Carlo Traversi did the 5th ascent instead. I think that’s the wrong route you’ve got the photo of. That route is somewhere on the Project Wall. From the description Joe gave, it sounds like Andy was pressured by a crew who somehow still couldn’t find the time or devote the effort to finding a new route. And what’s up with Joe K dissing Tommy Caldwell’s route Flex Luthor as a “turd”? Narc have you talked w/ Andy? Curious about his take on the situation. It would be nice to hear you get your fact straight about the entire topic and situation. You are simply wrong about many of the details in this write-up. If you want information to post a news-piece, I would suggest you get in contact with whom you are writing about and get the specifics straight as opposed to fabricating them. just email me if you want information. What information is wrong, Joe? It seems like the Narc is pretty much relaying information that has been previously posted on yours and others sites. Having read about this topic on your own blog, I think it is unfair to say the narc is fabricating any part of this write-up. Maybe you don’t like the fact that the whole situation casts you in an immature light, but then again that’s of your own doing. no, the narc’s report is entirely factual; rifle is featured choss. Hey Joe, Where did you get your van? I’m wondering if it’s the same dealer as where we got our Astro. if flex is a turd, i vote for exploding it to create a dope boulder field. rock cannot be wasted on chossy turds. clearly, exploding it is the only answer. look what it did for the sphinx crack! it is the only way. do it now. im with sock hands. Blow up flex luthor! Have you guys climbed in Utah. That pictures reminds me of that tons! Wow.